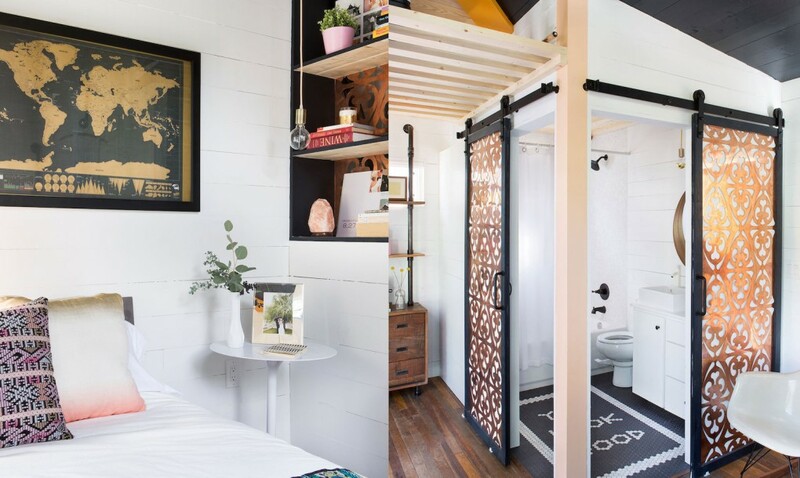 It’s true that tiny houses can sometimes feel confining, a fact that’s magnified when they’re set in places that get sweltering hot during the summer. 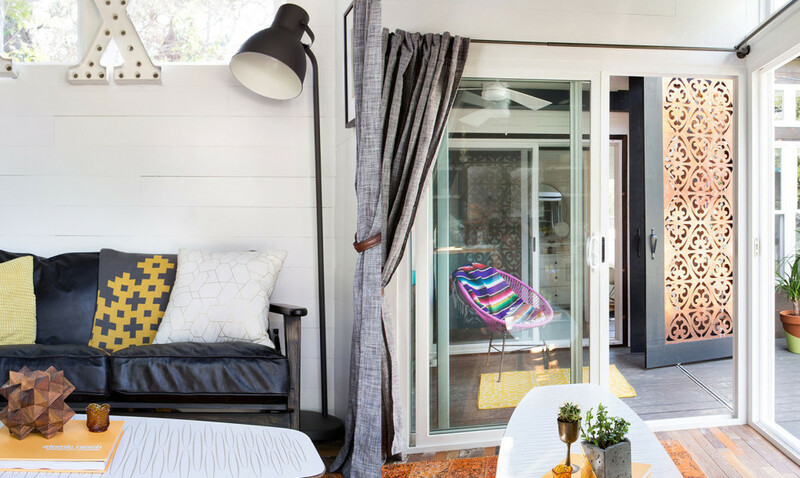 Air circulation, insulation and clever floor plans and storage solutions are the key to making a small space work in a state like Texas, where temperatures often reach well over 100 degrees during the day. 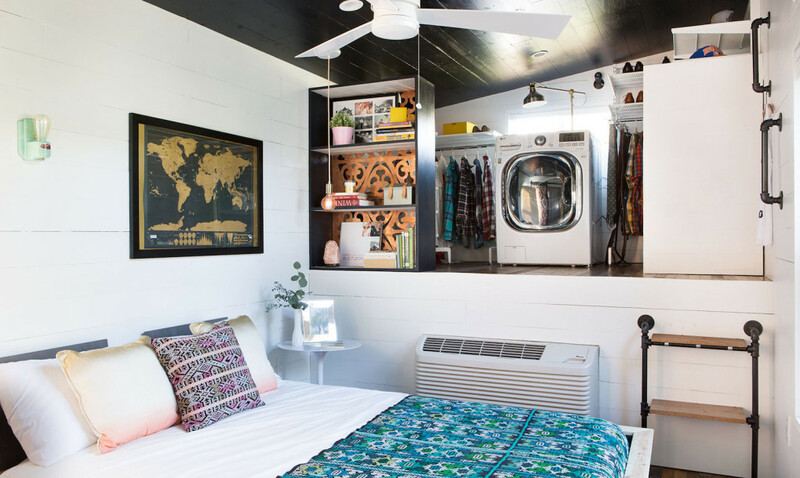 One interior designer has found a way to not only configure a comfortable space using unconventional materials, but also decorate it with a refreshing blend of mid-century modern and bohemian styles, adding pops of color and unexpected accents throughout the home. 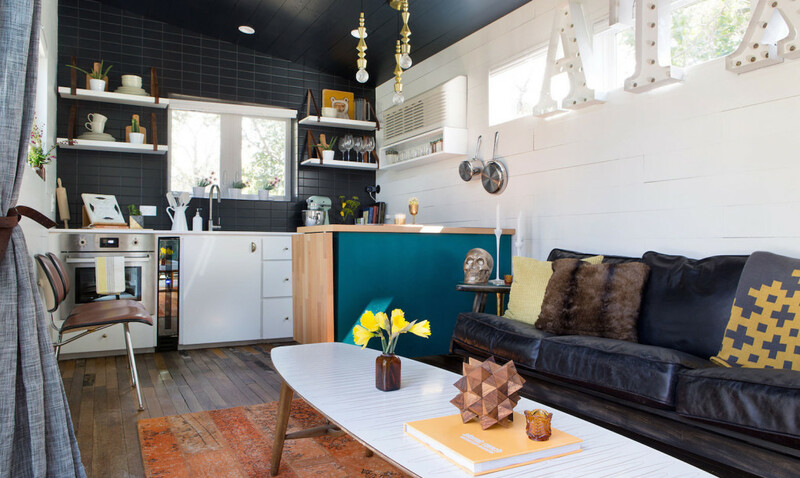 Kim Lewis of the firm VAGABOND calls this 380-square-foot dwelling in Austin ‘mid-century meets Marfa style,’ which infuses the micro home before you even step through the door. 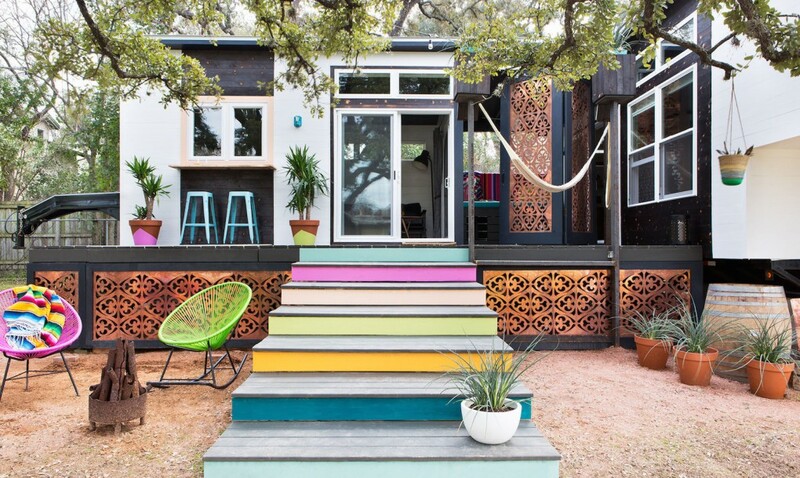 A set of colorfully painted wooden steps lead up to an elevated wraparound deck, which hugs the base of two gooseneck trailers. The trailers are positioned at a 90-degree angle to each other with a breezeway in between, promoting air circulation and creating a network of indoor/outdoor spaces that encourage connection to the outdoors. The space between the trailers is covered with a roof and equipped with a ceiling fan as an ideal place to cool off and enjoy the fresh air. A built-in bench offers seating for humans, with cut-outs beneath creating shaded spaces for their furry friends to relax. 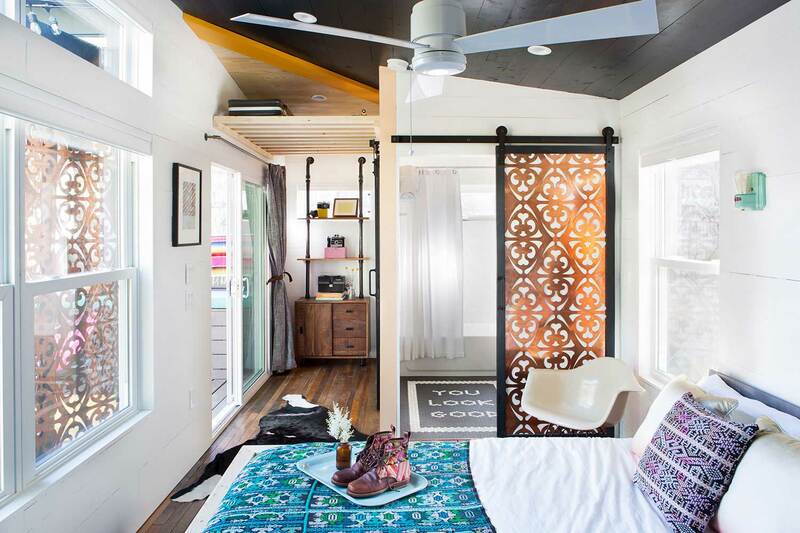 The same patterned trellis that disguises the bases of the trailers outside continues throughout the interior in the form of door screens on this little porch and between the bedroom and bathroom. 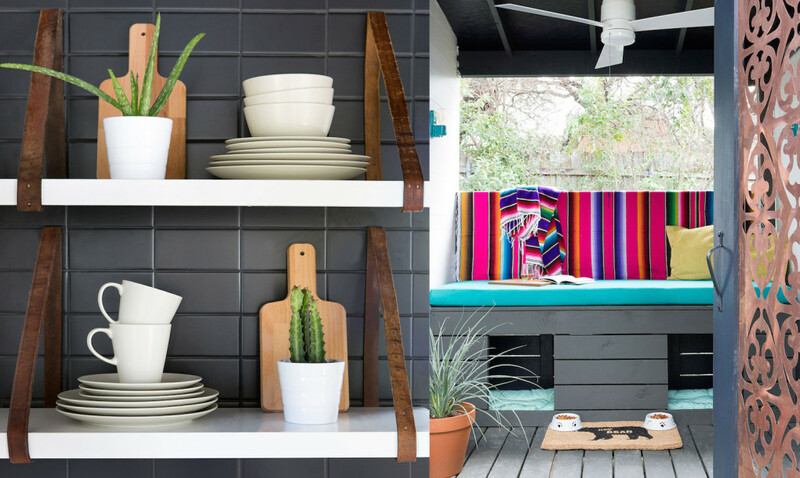 Inside, basic black and white surfaces provide a neutral modern backdrop for the inhabitants’ colorful belongings, including Guatemalan textiles. Pipe fittings utilized as handles and supports for steps and shelves add an industrial touch. Whereas the elevated area above the trailer hitch would normally house a bed, the double-trailer layout enables them to use it for storage instead, creating a spacious and conveniently located closet and laundry area. A pass-through bar and hammocks lure the owners and their guests back out onto the deck. The designer, who is known for her work on the television series Extreme Makeover, notes that materials were carefully chosen to keep the trailers mobile in case the couple wants to pick up and move their home somewhere else. 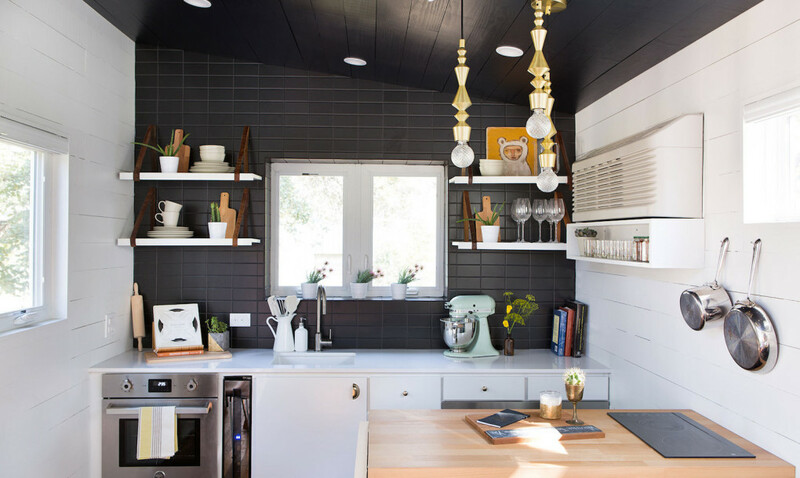 Granite and heavy hardwoods were nixed in favor of Silestone countertops and lighter woods. Two low-profile refrigerator drawers fit beneath the kitchen counter to hold just as much as a traditional refrigerator without taking up too much space. 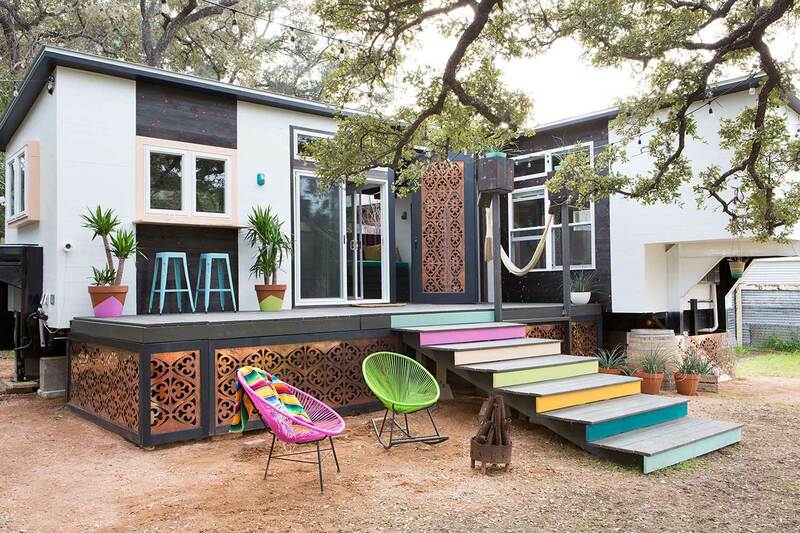 The overall effect is a fun twist on the tiny house trend.